Hundreds of people flocked to the Haw River Ballroom on the eve of Halloween for night one of two sold-out Sylvan Esso shows. 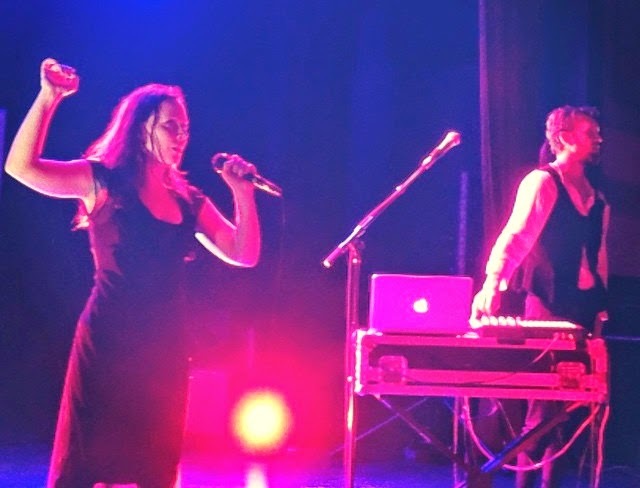 The electropop duo from Durham, NC have been touring with noteworthy bands such as tUnE-yArDs and Foster the People to promote their impressive debut album, Sylvan Esso. Fortunately for locals, they were able to make a pit stop at their old stomping grounds for two unforgettable Halloween shows. Skeletons, lights, and pumpkins decorated the walls of the ballroom while staff shared candy with the crowd. Guests felt the spirit of the season, donning masks, feathery headbands, and ghostly face paint. With high audience anticipation, Sylvan Esso took the stage dressed as legends Stevie Nicks and Mick Fleetwood. Amelia Meath and Nick Sanborn broke into their debut album with acceptance and excitement from the crowd. Meath's intoxicating voice crooned through each hit, her body gyrated as though the music pulsed right through her. Sanborn rarely took his eyes off his partner, listening to her every breath, never missing a cue. The two have a provocative stage presence; it's fun, playful and endlessly interactive. It seems obvious that the pair are only getting started. They have existed for merely a year and have already received high marks for their captivating live performances and recorded masterpieces. The album itself is artsy and bouncy, but unlike a lot synth-pop music, genuine emotion is ever so present and contagious. For more Sylvan Esso, NPR streamed a June performance from Washington D.C.'s 9:30 Club. Enjoy!